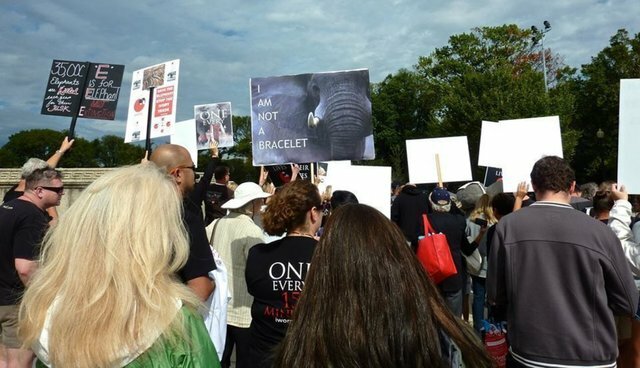 A week ago, Born Free staff marched for elephants in Kenya, England, and multiple cities in America. As part of the global marches for elephants and rhinos-and in some cities, lions, as well-we spoke out against the scourge of poaching that threatens some populations of elephants and rhinos across Africa. But, we're not alone, and that gives me hope. Oregon Congressman Peter DeFazio has introduced legislation to expedite sanctions against countries that are complicit in enabling the illegal trade in elephant ivory in contravention of the Convention on International Trade in Endangered Species (CITES) (the "TUSKER" Act). New mom, Chelsea Clinton, has said that she doesn't want her child to grow up in a world without elephants. The rock guitarist, Slash, has a song on his new album called "Beneath the Savage Sun," which is about the horror of elephant poaching, with lyrics including: "How many killing seasons can you justify; how many dead and bleeding only for an ivory lie; was it for the money; was it for the thrill..."
And, Brooke Darby, Deputy Assistant Secretary of the Bureau of International Narcotics and Law Enforcement Affairs, recently noted that, "Tens of thousands of elephants are indiscriminately slaughtered for their tusks each year across Africa, and thousands of heroic park rangers have laid their lives on the line to protect these wild animals. The illegal wildlife trade-including the illicit movement of elephant ivory-funds criminal organizations in Africa including terrorist outfits that weaken national security and threaten regional stability." Thousands upon thousands of other compassionate citizens across the country-across the world-are speaking out and calling for an end to the carnage. And, with an estimated 35,000-50,000 elephants killed in Africa annually, the Obama Administration is speaking out, as well. It issued an Executive Order to set up an Advisory Council on Wildlife Trafficking in July 2013, which was designed to increase interagency cooperation for combating wildlife trade. This momentous action set off a chain reaction of events and interest, both within the government and without. In fact, the sudden attention to poaching permeated every level of society: federal executive and legislative branches, state government, media, activist groups, and everyday citizens. One of the major outcomes of the Administration's focus was a National Strategy for Combating Wildlife Trafficking in February of 2014, which prompted the U.S. Fish and Wildlife Service (FWS) to develop new regulations restricting the commercialization of ivory. You can read some of the major events from this remarkable domino effect here. Certainly a step in the right direction. At least we are taking responsibility for our role in the crisis, and taking steps to address it. No progressive policy comes without controversy, however, and there are still those who wish to deny the potential that every sale of ivory has to be a loophole for illegal ivory laundering. The new FWS rules have been harshly attacked by some in Congress and by special interest groups since the moment they were announced. Various tactics have been employed to unravel them, including a highly critical hearing in the House Natural Resources Committee, an attempt to withhold funds for the next fiscal year, a probing letter from two Senators, and a bill that is misleadingly named the "Lawful Ivory Protection Act of 2014." Fortunately, none has been successful to date, except for the musical instrument lobby's bid to secure an exemption for some instruments that contain ivory. I applaud anyone who stands up to the special interests working hard to exploit the last wild animals of the planet. The elephants need our voices-our LOUD voices-and I'm so glad that Slash and Born Free USA's Kate Dylewsky are speaking out with equal vigor. And I hope that everyone, everywhere, listens.